Each spring animal shelters receive many kittens too young to survive more than an hour or two without a mother. These kittens are called “neonates.” Sadly, most of the neonate kittens that shelters takes in are orphans. People find these babies in their garage, barn, flowerbeds and many other places where the mother felt safe from predators and intruders while she gave birth. Understandably, some people feel they are helping neonate kittens when they bring them to a shelter. Actually, they are putting these little lives at tremendous risk because euthanasia may be the only way a shelter can save them from suffering an agonizing death by starvation. To avoid such a horrible fate, leave neonate kittens where you find them; they are not abandoned – and momma cat is their best guarantee of survival. A momma cat, called a queen, will sometimes leave her offspring to find food or water for herself. She will return to care for them – but when her kittens are taken away from her, they have no chance to survive without significant human intervention. Healthy weaned kittens are quickly adopted. So anything we can do to help neonates reach full “kitten-hood” (8 weeks) improves their chance of eventually finding a loving home. The best way to help neonate kittens is to leave them with mom until they are old enough to survive on their own before bringing them to a shelter. Despite this advice, many neonate kittens still find their way to animal shelters every year. So, each year animal shelters prepare for this influx by recruiting volunteers willing to help these innocents survive by joining what I call, the Baby Bottle Brigade. 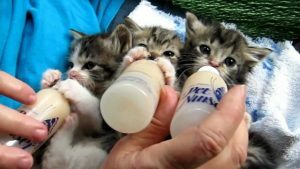 Ideally, local shelters train their Baby Bottle Brigade volunteers to foster these babies at home until they are old enough to be spayed or neutered and placed for adoption. The Merriam-Webster Dictionary defines “foster” as providing parental care and nurture to children not related through legal or blood ties. State Law defines “adoptable animals” as animals 8 weeks of age or older; which means these little orphans have no legal standing. In fact, most shelters don’t even count neonates in their euthanasia statistics. At shelters I am associated with, we report the outcome of every animal, because we believe every animal counts. Most animal shelters do their best to provide loving care and nurture even to these lost souls with whom we have no legal or blood ties. The problem is that animal shelters can’t save them all by themselves. They need our help. Depending on the age of the neonates, they may require four to eight weeks of intense foster care. Though many dedicated shelter employees help foster neonates above and beyond their daily job duties, many kittens will not survive without your help. If you are willing and able to help save these lives, most animal shelters will provide the training, support and supplies you need to be a successful foster parent. This is a big commitment and a true test of our compassion. Even with our best efforts, not all foster babies will survive. But they can all be loved. These babies need to be bottle fed every two hours around the clock for several weeks – making this the perfect family, club, or faith-based organizational project. Fostering helpless neonates is an ideal way to foster compassion and respect for the true value and sanctity of all life in our community. Have you saved a life today? Join the Baby Bottle Brigade in your community and experience the satisfaction that comes from being a foster parent and saving a life. 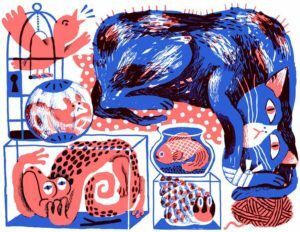 The New York Times recently (May 7) ran a piece by Jessica Pierce asking the provocative question “Is your pet lonely and bored?” Today there are as many pets in the United States as there are people; and in most homes pets are family — and not just dogs and cats, but rabbits, rats, bearded dragons and snakes. According to many veterinarians and psychologists this phenomenon is evidence of a deepening “human-animal bond.” Scientists studying animal cognition and emotion are continually peeling back the mysteries of animal minds, revealing an incredible and often surprising richness in the thoughts and feelings of other creatures. In light of this growing understanding, Pierce confesses feelings of guilt for having had subjected her goldfish to a life of endless tedium, swimming circles in a small bowl – knowing now that goldfish feel pain and engage in socially complex behaviors. Her feelings of guilt were amplified when University of Tennessee ethologist Gordon Burghardt’s proclaimed “the best we can do for captive reptiles is a life of ‘controlled deprivation.’” Pierce owned a leopard gecko named Lizzy who died after what she now recognizes as two torturous years despite her best efforts to provide proper care. Pierce’s personal awakening caused her to ask how many other “well-meaning pet owners unwittingly cause harm by keeping animals in captive environments that might not meet their behavioral needs”? In addition to the ethical issues affecting the many small creatures we stuff into cages and tanks, she also asked challenging moral questions regarding our best friends: dogs and cats. Dogs and cats have lived in close contact with humans for thousands of years and are well adapted to living as our companions. They can form close bonds and communicate their needs and preferences to us, and we to them. Yet their well-being may be more compromised than we’d like to admit. There are, of course, the obvious problems of cruelty, neglect, abandonment, the millions wasting away in shelters waiting for a “forever home” that will never materialize or those lives snuffed out because they don’t or can’t behave the way a “good” pet should. Pierce suggests that even the most well-meaning owner doesn’t always provide what an animal needs, and wonders if our dogs and cats suffer in ways we don’t readily comprehend as a result. How many dogs, for instance, get lots of attention inside a home, but rarely go outside? How many spend weekdays inside alone, while their owners are at work, save for the one or two times a dog walker or neighbor drops by for a few minutes to feed and take them out briefly? Is it possible our animals are suffering from loneliness or boredom? In addition to love, dogs and cats need our time, space, energy, patience, money and a strong sense of commitment. If we buy fewer dogs and cats from breeders and pet stores, the pet population boom might gradually taper off, and the numbers of abandoned animals dying in shelters should start to decline as well. It can be difficult to recognize, much less admit, the harmful aspects of pet ownership when all we hear is how beloved and happy pets are in our company, and how beautiful and enduring the human-animal bond is – all of which is often true! But if we really care about our animals, great and small, we will look beyond these sentimentalities and carefully scrutinize our actual practices. Animals are not toys; they are living, sentient creatures. Pierce suggests that if we view the world through their eyes we’d better understand the quality of life we provide or deprive them. Source: Is your pet suffering?